Strand cane or hank cane is used when doing hand weaving for the weaving of caned chairs. **If your chair seat (or back) has holes drilled into the wood around the outside edge of the large hole, you will need to do hand weaving. If there is a groove around the outside edge, then you will install machine woven cane. We have three different widths of strand cane in stock, but can get other sizes, if needed. Contact us for more information. See the chart below to determine what size you need. Click here to see other supplies you might need. Full Hank - Approximately 800-1000 feet of cane per hank. One hank will do three average size chair seats (12" x 14"). 1 Chair Coil - Approximately 270 feet per bundle which will do one average size (12" x 14") chair seat & includes an 8' strand of Binder Cane for finishing. 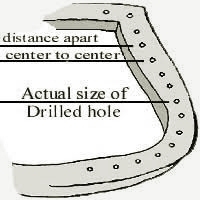 To Determine the size of cane needed: Measure hole size & measure the distance from center to center of 2 adjacent holes. Size Hole Diameter Crt. to Ctr.